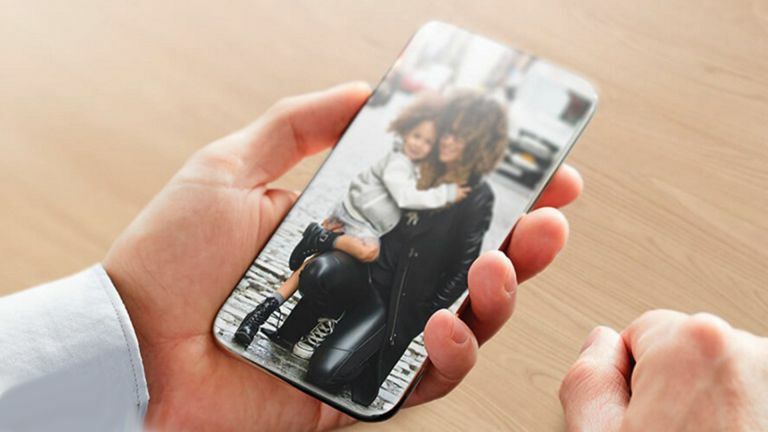 The new iPhone 11 may do away with the notch of the iPhone XS for a true all-screen display just like the upcoming Samsung Galaxy S10. The above image of the iPhone 11 concept comes from Patently Apple along with some details on just how that display could be a reality soon. The site reports that Apple supplier, AMS Designs, has announced new sensors for 3D facial recognition that work from underneath the screen. This would mean that Apple can keep its Face ID unlocking system but do away with the unsightly notch for a true bezel-free display. How it will get rid of the selfie camera is less clear – perhaps it'll offer a slide up camera system. Samsung is reportedly going for an ultrasonic fingerprint reader to take care of its security while avoiding a notch. Although rumours suggest that even the top end S10 may still have a front facing camera in that punch-hole style screen. That said, Samsung has teased its New Infinity display which has no front facing camera in sight. Crucial to this announcement about the under-screen sensors is the fact they only work with OLED screens. Apple is expected to do away with the affordable iPhone XR LCD screen and make all its iPhones OLED for the iPhone 11. So there is a chance all the models will be notch free. Apple likes to offer consistency, so here's hoping that's the case, including an affordable version. Apple is expected to launch its iPhone 11 at the usual time of around September. So the Samsung Galaxy S10, expected on 20 February, will have been out for quite some time by then, perhaps making that all-screen display less exciting.